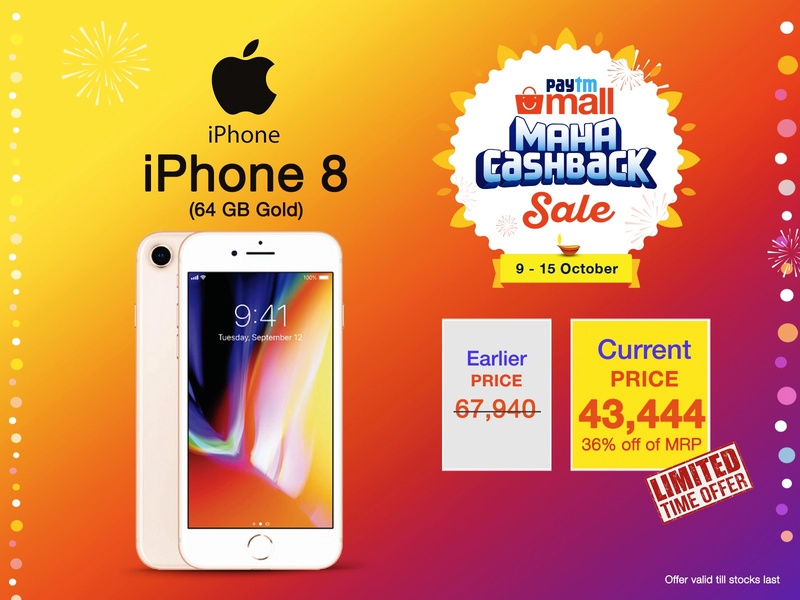 Home apple iphone apps and softwares cashback offer iphone 8 iphone price drop mobiles and smartphones PayTM mall ratina hd display iPhone Price Crash Alert! : iPhone 8 (64 GB) Available For Rs. 43,444 only @ Paytm Mall Maha Cashback Sale ! iPhone Price Crash Alert! : iPhone 8 (64 GB) Available For Rs. 43,444 only @ Paytm Mall Maha Cashback Sale ! Apple enthusiasts have a reason to cheer as price of iPhone 8 (64 GB) has dropped sharply on Paytm Mall. Originally priced at Rs. 67,940, the in-demand smartphone can be purchased by Paytm Mall customers for an effective price of Rs. 43,444 only! The only catch is that the offer is only valid till today till stocks last. iPhone 8 comes loaded with Apple’s revolutionary A11 Bionic chip and a 64-bit architecture that equips the device with exemplary Artificial Intelligence capabilities. The splash, water, and dust-resistant device further has a Retina HD display that gives a truly immersive video watching experience to its users. For the shutterbugs, iPhone 8 has a 12 MP primary camera and a 7 MP secondary camera (with HD FaceTime). The device is able to shoot 4K videos with up to 60FPS (frames per second) and up to 1080p resolution. The AI-driven neural engine automatically enhances the pictures taken by the smartphone users. Paytm Mall is offering a flat 13% discount on the device bringing its price down to Rs. 59,445. On top of it, the platform is also offering a flat cashback of Rs. 13,500 on the device. Customer can also avail an additional Rs. 2,500 cashback by making their purchase via ICICI Bank Debit or Credit Card, making iPhone 8 effectively available for Rs. 43,444 only - exclusively on Paytm Mall. ThIis offer is only valid for a limited time. Hurry, log on to Paytm Mall now!